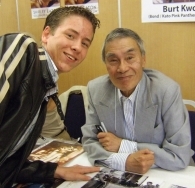 I met Burt Kwouk at Kempton Park racecourse for the Starcon event in September 2006. I was very pleased because I particularly wanted him to sign my Jeff Marshall Goldfinger lithograph. Leaning right across a wide table wasn't really the best way to be photographed, but I was with a Bond enthusiast from Canada, Jean Goyette, and he took a much better one of me sitting next to Burt. Thank you, Jean! 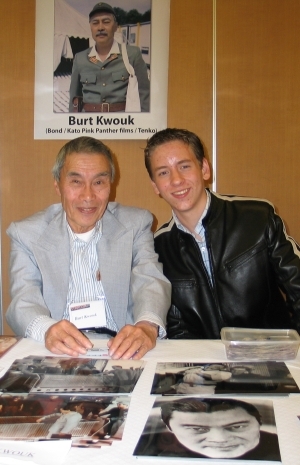 Burt Kwouk was born in Manchester in 1930, but grew up in Shanghai. He is probably best known for playing Inspector Clouseau's servant, Cato Fong, in the Pink Panther films, with Peter Sellers. Burt Kwouk's other British TV appearances are too numerous to mention, but include The Avengers, The Saint (with Roger Moore), Dr Who, Howard's Way, Lovejoy, The Bill and, most recently, as Entwistle in the long-running BBC series Last of the Summer Wine. During the 1980s, Kwouk found fame as the Japanese commandant, Major Yamauchi, in the long running TV POW series Tenko, about a group of European women captured by the Japanese in Singapore, and subsequently harshly treated by their prison-camp guards. Burt Kwouk also had a small role as one of Blofeld's henchmen in You Only Live Twice (1967). Burt Kwouk's earlier films included The Inn of the Sixth Happiness (1958) with Ingrid Bergman and The Brides of Fu Manchu (1965), with Christopher Lee in the title role. 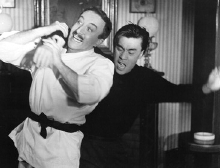 Cato is a martial arts expert who has been instructed by Clouseau to attack him without warning, and so kicks and chops come the Inspector's way at the most inappropriate times! It was in the 1960s that Kwouk made his first Bond film appearance, as Mr Ling in Goldfinger (1964). 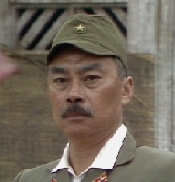 Ling is a Chinese nuclear expert sent to oversee the bomb that China has given to Goldfinger to blow up Fort Knox. Ling is later double-crossed and shot by Goldfinger. Bert Kwouk died on 24th May 2016.